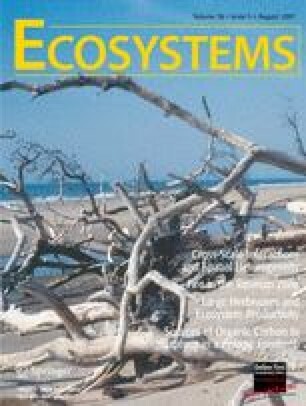 Ecosystem patterns and disturbance processes at one spatial scale often interact with processes at another scale, and the result of such cross-scale interactions can be nonlinear dynamics with thresholds. Examples of cross-scale pattern-process relationships and interactions among forest dieback, fire, and erosion are illustrated from northern New Mexico (USA) landscapes, where long-term studies have recently documented all of these disturbance processes. For example, environmental stress, operating on individual trees, can cause tree death that is amplified by insect mortality agents to propagate to patch and then landscape or even regional-scale forest dieback. Severe drought and unusual warmth in the southwestern USA since the late 1990s apparently exceeded species-specific physiological thresholds for multiple tree species, resulting in substantial vegetation mortality across millions of hectares of woodlands and forests in recent years. Predictions of forest dieback across spatial scales are constrained by uncertainties associated with: limited knowledge of species-specific physiological thresholds; individual and site-specific variation in these mortality thresholds; and positive feedback loops between rapidly-responding insect herbivore populations and their stressed plant hosts, sometimes resulting in nonlinear “pest” outbreak dynamics. Fire behavior also exhibits nonlinearities across spatial scales, illustrated by changes in historic fire regimes where patch-scale grazing disturbance led to regional-scale collapse of surface fire activity and subsequent recent increases in the scale of extreme fire events in New Mexico. Vegetation dieback interacts with fire activity by modifying fuel amounts and configurations at multiple spatial scales. Runoff and erosion processes are also subject to scale-dependent threshold behaviors, exemplified by ecohydrological work in semiarid New Mexico watersheds showing how declines in ground surface cover lead to non-linear increases in bare patch connectivity and thereby accelerated runoff and erosion at hillslope and watershed scales. Vegetation dieback, grazing, and fire can change land surface properties and cross-scale hydrologic connectivities, directly altering ecohydrological patterns of runoff and erosion. The interactions among disturbance processes across spatial scales can be key drivers in ecosystem dynamics, as illustrated by these studies of recent landscape changes in northern New Mexico. To better anticipate and mitigate accelerating human impacts to the planetary ecosystem at all spatial scales, improvements are needed in our conceptual and quantitative understanding of cross-scale interactions among disturbance processes. This work was supported by the Global Change Program of the U.S. Geological Survey’s Biological Resources Discipline, the USGS Fort Collins Science Center, and the USDI National Park Service, Bandelier National Monument. I particularly thank Kay Beeley (Bandelier National Monument) and Rebecca Oertel (USGS) for data collection and figure support, Tom Swetnam’s fire history group at the University of Arizona Laboratory of Tree-Ring Research for many collaborations through the years, Loren Iverson and Janine Paschke for West-wide GIS data from the US Forest Service’s Aerial Detection Forest Health Monitoring program, Dave Breshears (University of Arizona) and Brad Wilcox (Texas Tech University) for long-standing ecohydrology collaborations, and Deb Peters (USDA Jornada Experimental Range) for helpful discussions on cross-scale interactions. Comments by Nate Stephenson, Don McKenzie, Matt Brooks, Julio Betancourt, Susana Bautista, Dave Breshears, an anonymous reviewer, and especially Dean Urban improved this paper.